This line just keeps getting cooler. DC Comics, if you’re unaware, launched a Walmart-only series of “Giant” comics earlier this year. The continuing run contains comics of the jumbo variety, clocking in at 100 pages. Each issue holds a bunch of individual tales, some classics and a new story. The idea is to get new readers, who don’t go to “comic books shops” to hop on with the DC Universe. We’ve been following along here at BG, and they look like fun books. I can’t say I’ve ever actually seen one in a store though, which seems to be a common issue. This new book is probably going to be right in line with that too, since it’s Halloween themed. “Hollow” is a 12-page story written by Brian Azzarello (BATMAN: DAMNED, THE DARK KNIGHT III: THE MASTER RACE), with art by fan-favorite artist Greg Capullo (DARK NIGHTS: METAL, BATMAN: LAST KNIGHT ON EARTH). 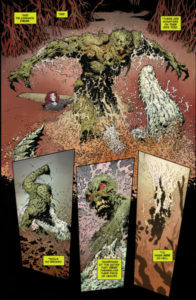 Children can’t help but be curious about what lurks in the woods at the edge of town on Halloween night…and unfortunately for them, this group of trick-or-treaters has crossed paths with a mysterious witch who has her own tale to tell about where curiosity leads—directly into the path of the creature known only as Swamp Thing! Can they escape her clutches? Or is there something much worse out there that they should REALLY fear? For more information on Azzarello and Capullo’s approach to this new original story, check out this exclusive interview in today’s Washington Post. This 100-Page Giant sells for $4.99 and includes several classic fright-filled stories from DC’s history, led by the iconic HOUSE OF SECRETS #92 from 1971, which features Swamp Thing’s very first appearance, written and drawn by co-creators Len Wein (writer) and Bernie Wrightson (artist). 1971’s “Night of the Reaper,” from BATMAN #237, features two more giants of superhero storytelling, writer Denny O’Neil and artist Neal Adams, telling a Halloween tale of revenge and the search for a Nazi war criminal. 2007’s DC INFINITE HALLOWEEN SPECIAL also contributes to this issue, with stories featuring DC heroes Superman (“Strange Cargo”), Blue Devil and Enchantress (“The Pumpkin Sinister”) and Zatanna (“Kcirt ro Taert”). 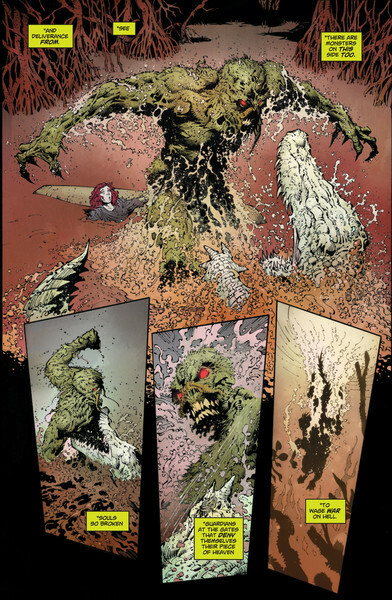 The book also reprints a Batman tale from the 2008 DC INFINITE HALLOWEEN SPECIAL, “The Ballad of Jonathan Crane,” as well as “Night Gods” from 2010’s THE BRAVE AND THE BOLD, starring Aquaman and the Demon. Check it out this month at Walmart stores. It’ll cost you $4.99 USD.